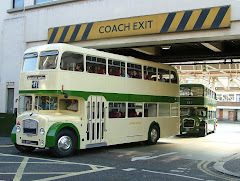 West Yorkshire PTE 8534 was the penultimate Plaxton Derwent bodied Leopard delivered to the undertaking in 1975/6. The 35 short wheelbase Leopards were delivered in three batches 8501-8513, 8514-8525 and 8526-8535 and were commonly associated with the Todmorden and Halifax areas of the "Metro" operations. They survived in service until 1992 but 8534 still operated out at Todmorden, in Todmorden JOC livery until 1999 when it passed into preservation. 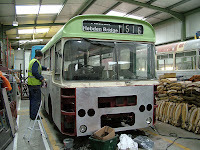 Latterly acquired by Andy Rawnsley, the bus is at The BusWorks for mechanical work, a complete repanel, re-flooring, refurbished seating and a repaint back into original WYPTE livery.